Well now it’s raining so I’m still indoors. But I’ve found things to do and it looks like I might at least get a bit of garde n clearing done tomorrow if as promised the sun comes out. 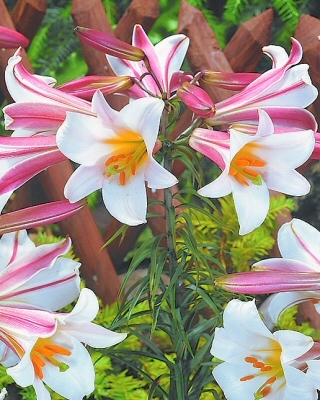 I love lillies and last week the catalogue arrived. Having drooled for quite a while deciding which to have I’m getting some for myself but also planning to pot some up for a friend who will love them for her birthday in April. They’ll be just on their way up and I’m sure she’ll enjoy the anticipation of waiting for them to flower as much as I do. I’m getting her my favourite lillium regale. They are just gorgeous, the scent just sums up summer for me and if you plant them in a pot and move them close to your seating area you can enjoy them whilst they’re at their best and then as they fade move them away until next year. The other catalogues I’m pouring over at the moment are the seed catalogues. Whatever else I do I will have a veg plot this spring and so what to plant, and when to get it going is the next thing on my mind. Someone sent me a link to GrowVeg.com which helps you to plan your veg beds and allows you to draw it up on line. It’s dead easy and you get 30 days free trial (which should really get you well o n the way to sorting out this year’s planting) and it’s not one of those sites where you have to put in your bank details for your freebie. As for the catalogues – send for them now, they don’t cost a penny and they’re full of inspiration.